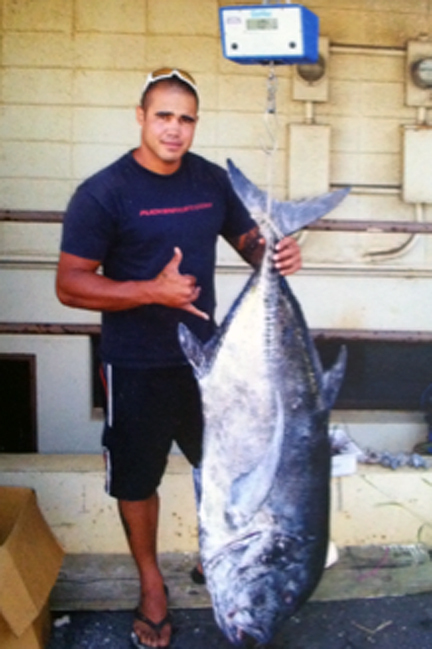 Kurtis Chong Kee landed THREE 100-plus-lb ulua in 2010. His fish weighed 117.6, 105.5 and 101 lbs and all were caught from the shore on Maui. Kurtis caught the 105.5-lb ulua pictured here at Keanae and later weighed the fish at Brian Yoshikawa's store, Maui Sporting Goods. Kurtis battled the fish using a 13-foot Nitro pole, Penn 4/0 reel and 60-lb test Ande line.